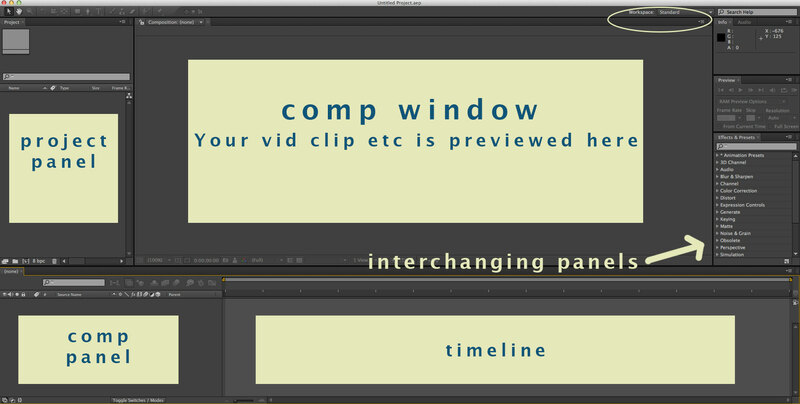 As part of my special project for this quarter, I will be curating a multi-faceted course companion for After Effects. After Effects is an Adobe Program (exports .aep), very similar in its design as its buddies Photoshop, Flash, and PremierPro. It’s also compatible with these other softwares in the same way that InDesign, Photoshop and Illustrator have some nesting capabilities. As in other Adobe Software, where “artwork” is the file you are creating, in After Effects, you are creating a “composition,” like music– there’s timing involved. Like InDesign, until you export as video, your .aep file merely links to existing videos stored on your hard drive and that keeps down file size. It’s more like PremierPro in the interface. A lot of shortcuts are similar between AE and other Adobe programs, ex. shift constrains and spacebar gives you the hand tool. I would recommend being familiar with how layers (especially layer effects) in Adobe programs work before diving into After Effects because it has layers on steroids. This tutorial reflects how we need to build files– with the clever use of shapes. You see a moving fluctuating frame, but it is a series of squares on top of each other. What is pre-comping? “PreComposing is the process of creating a separate composition out of one or more layers in your open composition” says Barry Williams. GreyScaleGorilla guy is taking an animation he made and duplicating it and altering it to be a motif for his composition.